A tobacco pack collector who recently purchased a 1910 era Piedmont pack on eBay and pulled a T206 Otto Knabe card from the pack. For the complete coverage, please read A T206 pulled from a 1910 era Piedmont pack. T206s were inserted in slide-out-shell (a.k.a. match box) type of tobacco packs. 350 Series T206 cards were inserted in tobacco packs with dated "Aug 5, 1909" tax stamp. 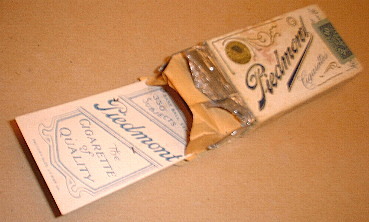 Piedmont cards with FACTORY No. 25, 2nd DIST. VA were inserted in pack manufactured by Factory No. 25 of 2nd Dist. of Virginia. Tobacco cards pulled from tobacco packs do not come out in "GEM MINT" condition. Sports series cards pulled from 1910 era tobacco packs were from 350 Series. They could be from 150 or 460 Series. 1. 1910 Dewitt Clinton series tax stamps with dated "Aug 5, 1909" was used through out 1910's until the tobacco manufacturers have used them all up (approximately from 1909 until 1917). 2. Other than sports series such as T206 or T205, it is possible to pull non-sports tobacco cards (eg. fishes, birds, military issues).